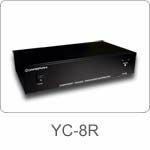 The YC-8R is the latest innovative Component Video(YPbPr) Distribution Amplifier. YC-8R add the audio function. It is not only useful for signals distribution from high quality Video devices, Video game consoles, Video CDs, DVDs, Satellite Receivers, STB set-top boxes but also useful for audio source distribution from CD player and tuners for multi-zone sound system. The color of YC-8R is black and the dimension is 88(H)x425(W)x247(D)mm. 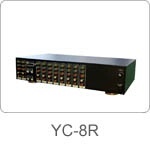 YC-8R supports 2 Video input and provides 8 output to HDTVs, LCD TVs, PDP TVs. That the 8 outlet distribution amplifier support Cable to run up to 200ft makes the output signal be as clean as the input signal. YC-8R can have a daisy chain to large number of televisions. Users can expand the TV quantity depending on what they need in actual condition. • Available as a common A/V receiver. • 8 sets of outlet can be connected with unlimited number of YC-8Xs.